The Fiat 500 was a model of car produced by the Italian car manufacturer Fiat in 1957, and which enjoyed a remarkable 20 year reign, with production finally ceasing in 1977. However this was not a total end of the Fiat 500 model range, as given its classic design, and wonderful value for money in addition to the practical and functional usefulness of the car saw a revival of the model in 2007. The removal of the 500 model from the market was met with genuine regret from the consumers, and the successor to the Fiat 500, the Fiat 126 was never met with anything even close to the genuine affection of the car. The Fiat drew a great deal of inspiration for its design from the Volkswagen Beetle, and whilst this was a trend adopted by many car producers, Fiat with the 500 model soon became the new industry benchmark, with many competitors and rivals alike trying to emulate the functional excellence of the 500 model. The Fiat 500 however refers to not one but two models of cars, the first Fiat 500 was also known as the Topolino which in English means “mouse”. The cars size merited its diminutive moniker, it was the smallest car in the world at its time of release, but whilst the size may have been small, the sale of the cars were certainly not, over half a million models in total were sold. 1957 saw the release of the 500 Nuova, and the Nuova wanted to expand and improve upon the innovative design of the Topolino, in particular, the designers of the Nuova wanted to optimize the space used, and thus make a smaller car, and this was achieved by utilising the engine in the rear of the car. The Nuova made use of a much smaller engine capacity than all of the Fiat models and was one of the earliest models to have a roof that folded all the way to the back end of the car. Upgrades were made to the Nuova in 1958 and were both cosmetic and mechanical. There was an increase in the power up to 15 hp, as well as minor alterations to the body of the car, with the use of chrome as well as an improvement of the windows, these were actually able to scroll down! 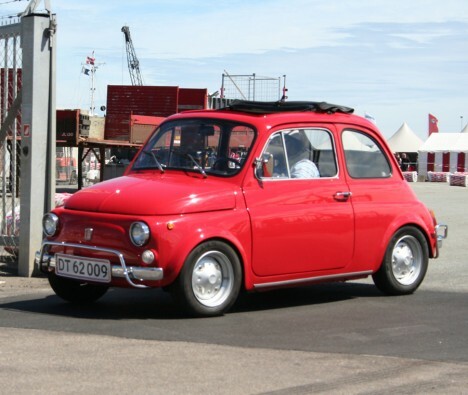 Fiat felt that this upgrade of the power rating to 15 hp wasn’t enough, and so when the sports version of the Fiat 500 was released, the power rating was increased to a much more respectable 21.5 hp. All the time, minor amendments and improvements were made, in order to maintain the competitive edge that the Fiat had managed to carve for itself within the market. Regardless of the cosmetic enhancements and changes that were made, the Fiat 500 was successful due to its economic nature, its efficient fuel consumption to miles driven ratio as well as the ease and cheapness by which it could be repaired. The compact size of the Fiat 500 made driving and weaving through the narrow Italian streets so much easier, and also enabled greater ease for parking and reversing again in such narrow conditions. This reputation for excellence at an affordable price, of the Fiat being economic and long lasting helped pave the way for a long-overdue revival in 2007. Since its rebranding of 2007, the Fiat has enjoyed tremendous success in its return to the open market, and has just as easily and competently impressed the new generation to which it has been released to.